Time Tracker is deeply integrated into the System. Calendar enables some cool features: Tracked Times are automatically added as Calendar Events, so the Dispatcher can immediately see what Employees have done. Also you can get a Reminder to be notified if next Accounting Report must be done. Notebook adds a Notebook to the App. Users can add Notes, Images, Audio and TimeTracker connects them with tracked times. If Notebook is sync’ed via Evernote these Notes are available at Desktop or in your Company for all Employees having access to your Notebook. 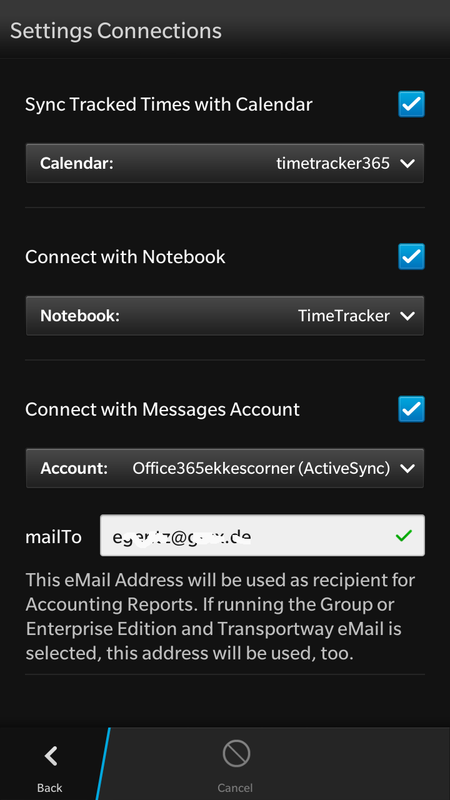 You must connect a Messages Account to be able to send Reports from inside TimeTracker as eMail messages to Customer or IT.